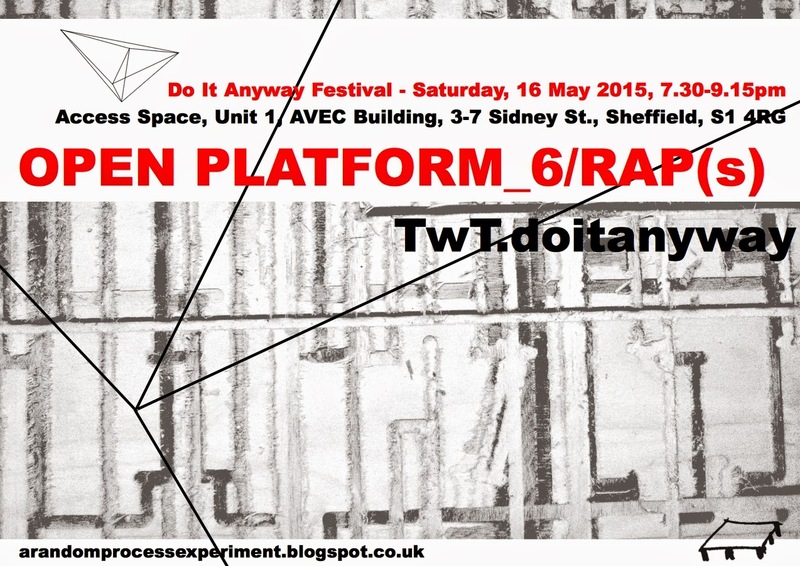 In May this year OPEN PLATFORM_6 returned as part of Do It Anyway Festival 2015 - the first digital arts festival at Access Space and the first Pixel Network festival in the UK. Do It Anyway Festival concluded Access Space's larger EU Grundtvig supported project Open Sourcing Festivals (in collaboration with other Pixelache Network nodes - more info below). Following on from OPEN PLATFORM_5 last year Access Space and OPEN PLATFORM/RAP(s)-TwT. once again welcomed artists, curators and cultural producers from Finland, Iceland, France, Norway, Latvia and the UK, introducing a new audience to our evenings of digital randomness! Susanne Palzer opens the event with a performance which emulates a colour picker screen for web designers running in the background. While moving a cursor across an invisible screen Susanne Palzer vocalizes RGB codes in random combinations. The performance intends to highlight how familiar digital processes only exist through hidden code and numbers - the vocalized colours remain unseen. At the same time the analogue performance allows for a combination of RGB codes which may produce 'impossible colours' and positions colours in random locations on the spectrum. "Old people, who can make clothes, fix cars and build furniture, think young people are good at technology because they can click on a picture. ..."
Not without humour 'A Talk about Fantasy and Technology' is a thought provoking and reflective call for adventure and fantasy. Looking at the past and future of digital technology Leila Johnston from Hack Circus demands to bring magic back into technology, "to empower it to be unpredictable and useless - to make it interesting to us again." A full transcript can be found here. Silvia Champion - Search Engine: What is home for you? Silvia Champion 'uses' the audience as a search engine by inviting everyone to access the platform and share their thoughts on the questions "What does home mean to you?" and "What can the word home mean?". She copies all researched info by hand to "process it later". At the end of the performance Silvia gives away soap houses made by the artist so everyone can "take a house home". With contributions by Egil Paulsen, Hlöðver Sigurðsson, Mathieu Marguerin, Nathalie Aubret, Susanne Palzer, John W. Fail, RíkharðurH. Friðriksson, Maite Cajaraville, Chella Quint, Jonathan Cook, Richard Bolam and many others. Chella Quint analogue tweets stories that took place in a time and place without Twitter. Reducing known fairytales to 140 characters, 'typed' with a pen and 'backspaced' by rubbing out, for 10 minutes the audience is only allowed to "tweet with their eyeballs and scroll past by looking up and down". "The client arrived late but wanted to start early." 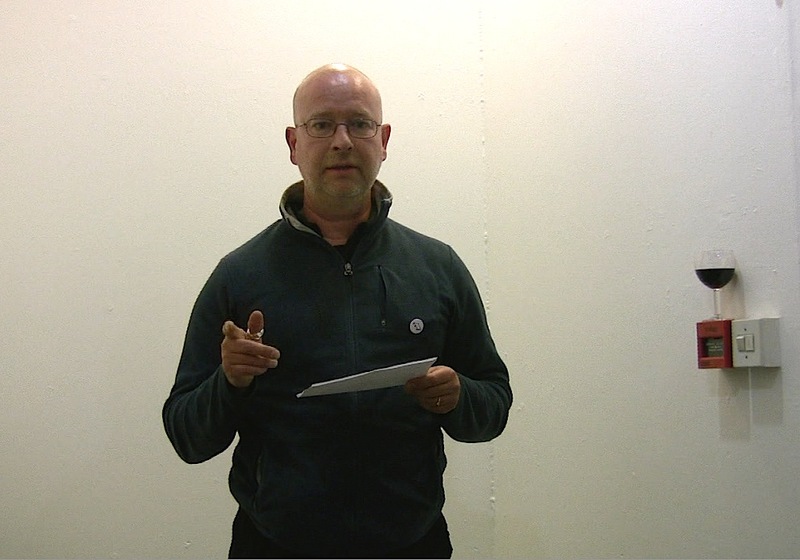 Drawing on his real-live experiences as an AV professional at conferences, award ceremonies and corporate events, Richard Bolam describes to us the ultimate Dystopian Conference. "It's all true." The Facebook album for OPEN PLATFORM_6 is here. Pixelache Network is an international network of cultural organizations enaging with art, technology and social change. 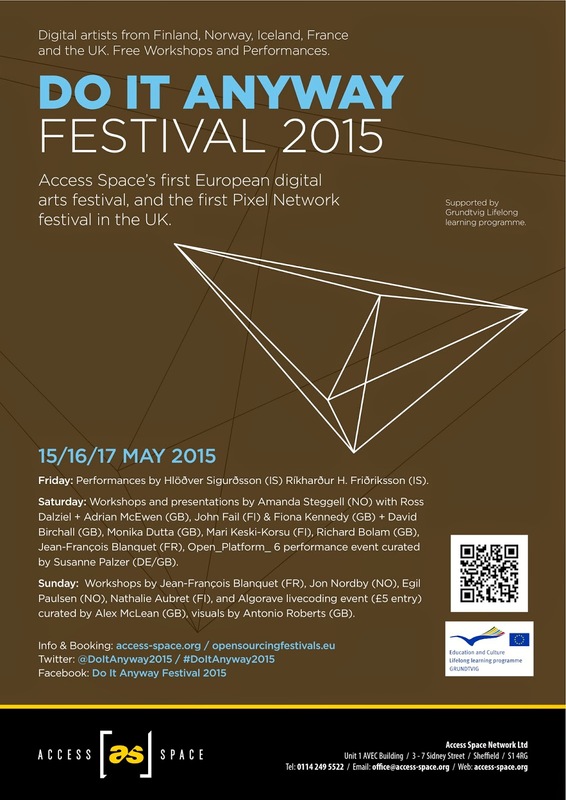 Access Space is the UK hub of Pixelache Network. Do It Anyway Festival ran from 15 to 17 May 2015. Over the weekend the festival featured free performances and workshops. Do It Anyway 2015 was developed as part of a larger EU Grundtvig supported project called Open Sourcing Festivals, co-produced by five experimental art, design and technology organizations from the Pixelache Network and focused on open source culture. Open Sourcing Festivals was a mobile circuit of workshops and seminars organized across Europe during 2013-2015 by Piksel (NO), Pikslaverk (IS), Mal au Pixel (FR) and Pixelache (FI). In the process the partners have been gradually working towards 'open-sourcing' the knowledge embodied in their respective workshops and festival production, in order to share it with a broader range of users. A database of resources and documentation is accessible here. 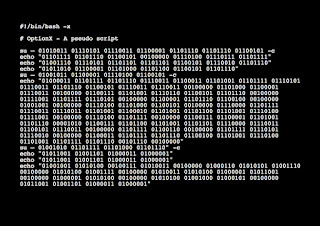 Pixelache Network is an international network of cultural organizations engaging with art, technology and social change. Access Space is the UK hub of Pixelache Network and recently completed the larger EU Grundtvig supported project Open Sourcing Festivals in collaboration with other Pixelache Network nodes. The project concluded with Do It Anyway Festival which Access Space presented in May 2015. 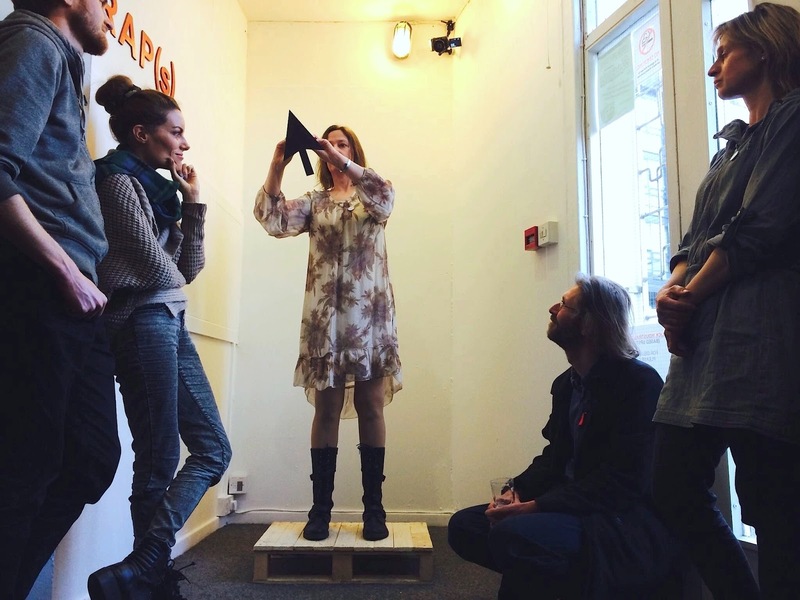 Last year, from 03-05 April 2014, Access Space hosted artists, curators and cultural producers from Finland, Iceland, France and Norway when representatives from project partner organizations visited Sheffield for the first time. "This is OPEN PLATFORM_5 ... Please stand well back from the platform!" 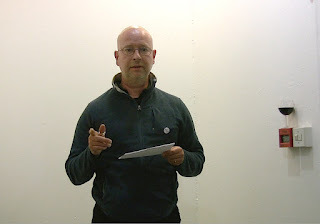 Opening OPEN PLATFORM_5 Richard Bolam delighted us with an imitation of automated announcements at train stations and on trains. "We apologize for the late running of this event. This is due to the wrong kind of snacks." " ... The job of the motherboard is to relay information between all components. Information is passed through electrical connections. Put simply it is the central circuit board of your computer ... A 2003 study found that spurious computer crashes, such as I/O read/write errors and screen distortions can be attributed not to faulty peripherals or software, but to ageing capacitors on motherboards. Despite the fact that it is important to have a good motherboard it will not necessarily increase the overall speed of your computer, none the less it is important to have one that is both reliable and stable as its role in the overall performance of the system is vital." Combining text, gestures and movements Liz Hall's performance 'Motherboard' looks at the central role of the mother image in computer terminology, and the correlation with the intimacy of human relationships. 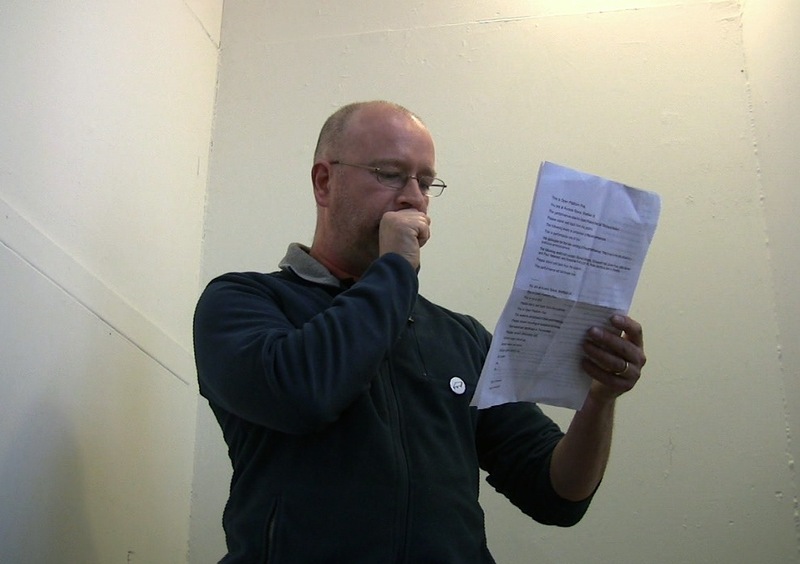 Jake Harries' current practice is based around using spam emails as raw material for composition and performing. For OPEN PLATFORM_5 he teamed up with Paul Newman to present the world premiere of Spam Theatre! Playing to a packed out 'house' the two actors performed a dramatic and passionate (spam) script, hamming it up Shakespearian-style - trying to get you to buy viagra! "To switch or not to switch? Lots of UNIX commands have options. (They are also called switches because you switch the options on and off by typing or not typing them when you type the command. ...) Options make commands both more versatile and more confusing. ..."
On-Off Trio presented a sound piece that as a project stayed close to the OPEN PLATFORM_5 theme but at the same time added the human factor by taking liberties with the language system of computing. 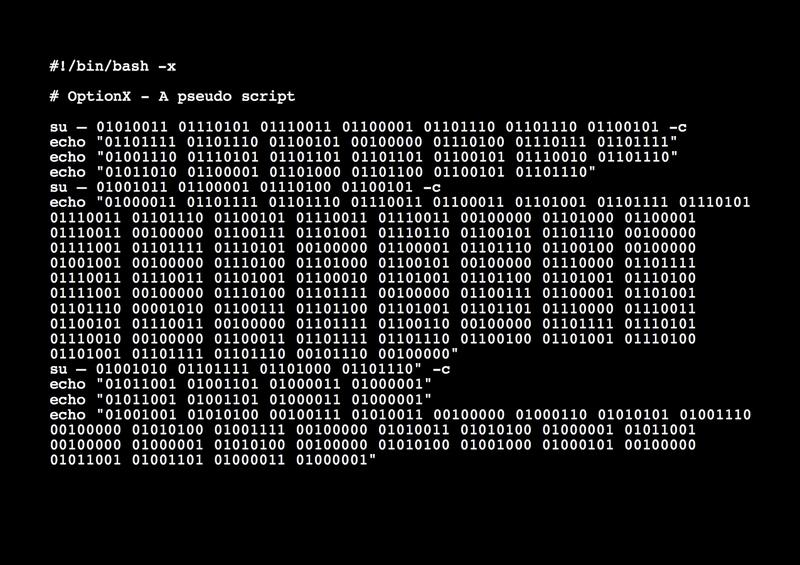 Performing a pseudo script which opened with the hashbangbinbash -x command - that allowed the audience 'to watch the script run' - the three performers executed binary shell script (1/0) with analogue switches (click/no click). On-Off Trio are John X. Moseley, Susanne Palzer and Kate Sicchio. The Facebook album for OPEN PLATFORM_5 is here. OPEN PLATFORM_6/RAP(s) - TwT.doitanyway will take place in the Access Space Foyer. More information about OPEN PLATFORM/RAP(s)-TwT. and previous events here. Like us on Facebook or send us a tweet! OPEN PLATFORM/RAP(s)-TwT. 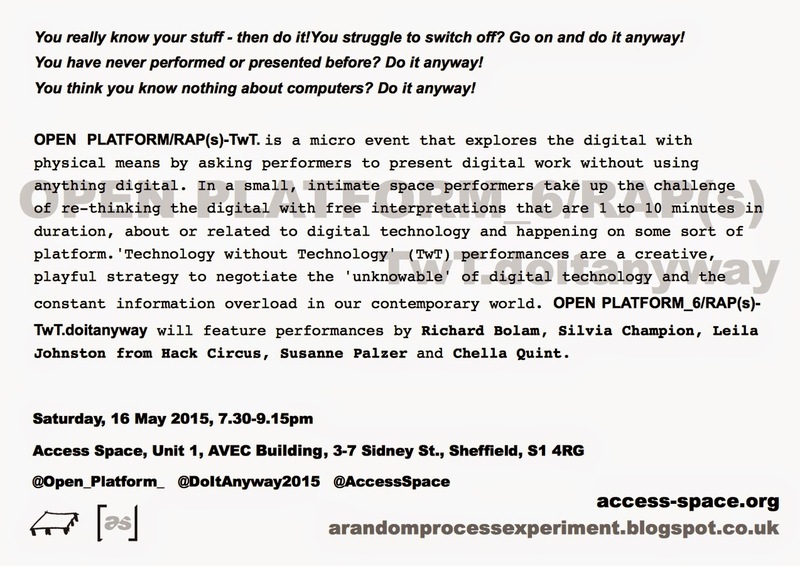 returns as part of Do It Anyway Festival 2015 with another evening of digital randomness! Do It Anyway Festival 2015 will run from Friday, 15 May to Sunday, 17 May and will bring digital artists from Finland, France, Iceland Norway, Latvia and the UK to Sheffield, South Yorkshire. Over the weekend the festival will feature free performances and workshops. Please book your workshop places via the Access Space website. OPEN PLATFORM/RAP(s) - TwT. 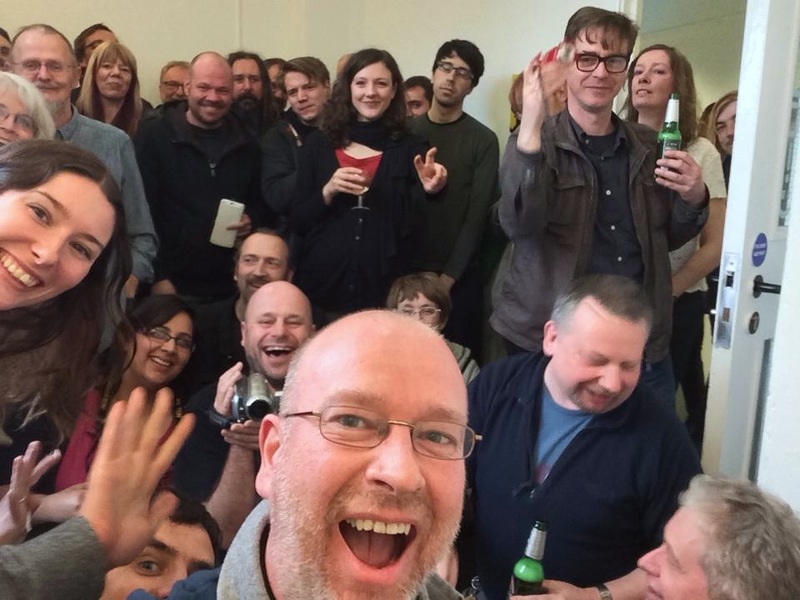 returns this year as part of Do it Anyway International Digital Arts Festival @AccessSpace in May and we invite you to contribute to another unforgettable evening of digital randomness! Experiment, perform, express, dance, present, sing, rap, read, or just tell us about your digital project or work - but without using anything digital! You really know your stuff - then do it! You have never performed or presented before? Do it anyway! You think you know nothing about computers? Do it anyway! You struggle to switch off? Go on and do it anyway! Anything goes as long as it is about or related to digital technology, 1 to 10 minutes in duration and happening on some sort of platform. You can use the wooden platform provided (65x95cm) or make your own. OPEN PLATFORM_6/RAP(s) - TwT.doitanyway is open to anyone interested in re-thinking the digital and not limited to artists or professional performers/presenters. 'Technology without Technolggy' (TwT) performances are a creative, playful strategy to negotiate the 'unknowable' of digital technology and the constant information overload in our contemporary world. OPEN PLATFORM/RAP(s) - TwT. is a micro event that explores the digital with physical means by asking performers to present digital work without using anything digital. 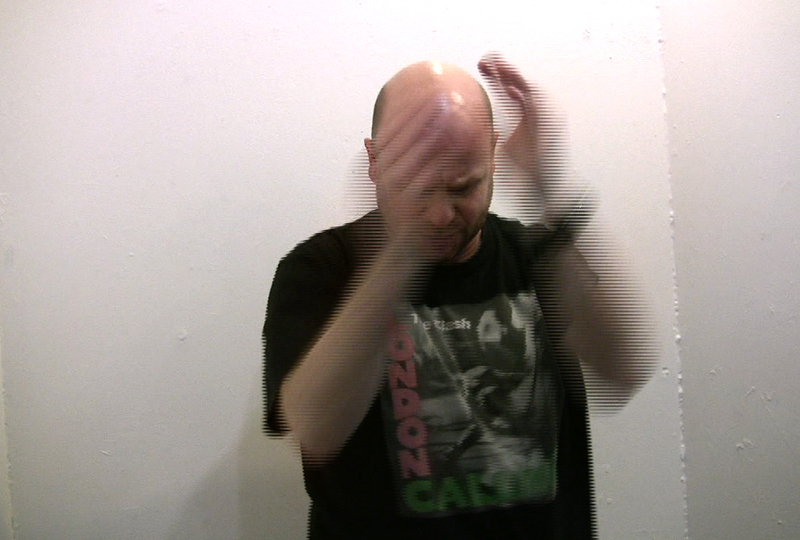 In a small, intimate space performers take up the challenge of re-thinking the digital with free interpretations that are 1 to 10 minutes in duration, about or related to digital technology and happening on some sort of platform. Join the TwT. (Technology without Technology) network today and help us build an even bigger digital network with physical means! 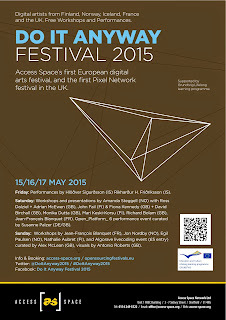 Do It Anyway Festival 2015 will run from Friday, 15 May to Sunday, 17 May and will be the first Pixelache Network International Digital Arts Festival in the UK! 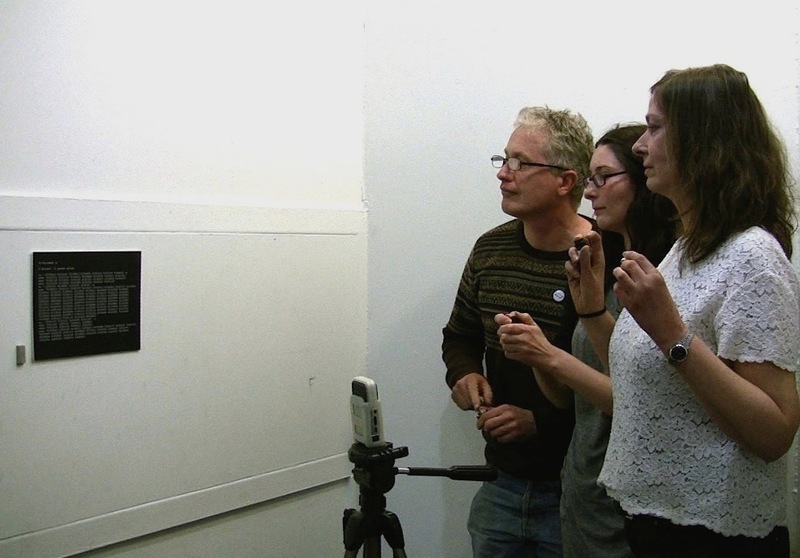 As the UK hub of the network Access Space is bringing arts practice from across Northern Europe - with participating artists from Finland, France, Iceland, Norway and Latvia - to Sheffield, South Yorkshire. Over the weekend the festival will feature free digital arts performances and workshops. More info here.